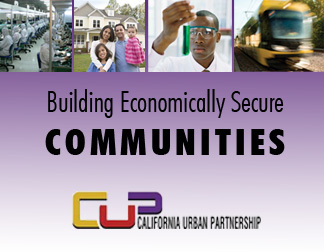 The CALIFORNIA URBAN PARTNERSHIP develops technology, joint venture, and policy solutions to build economic security in communities of color. We envision neighborhoods in regions where race is never a barrier for people to achieve economic prosperity. SACRAMENTO, (CA) - Keep up with the current progress of reaching 50,000 signatures. 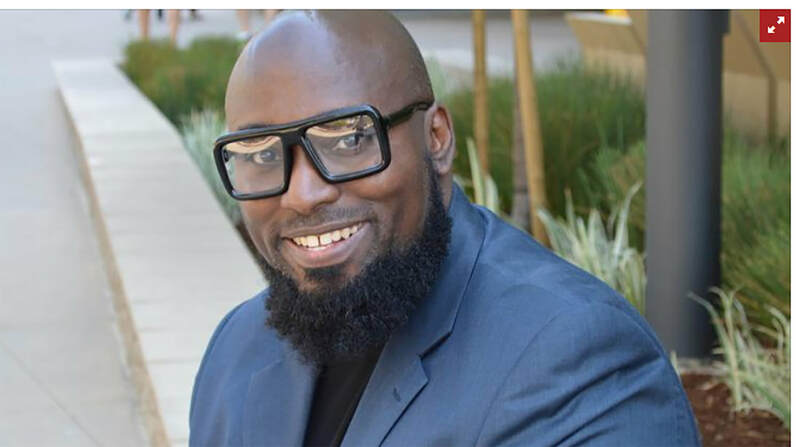 SACRAMENTO, (CA) - (An op-ed by Malaki Amen, CEO, California Urban Partnership) - Senseless tragedy has a way of shining a light on what needs to change, whether that was the murder of Emmett Till, the Parkland massacre or the unwarranted death of Stephon Clark. What needs to change in Sacramento is disinvestment in black and brown communities. Over the last several years, we’ve witnessed a massive effort to create amenities for the wealthy, including millions of public dollars invested in a basketball arena and the building of upscale housing in downtown and midtown. FRESNO BEE: ​As Fresno’s cannabis industry evolves, will people of color be locked out? FRESNO (CA) - Fresno has not seen the last of the cannabis debates – and whether the city’s nascent pot industry will be inclusive of people of color remains a top unresolved issue. Voters overwhelmingly approved a business license tax in November, and the Fresno City Council in December passed regulations for businesses. But another issue still isn’t settled: social equity in cannabis. Community members gather to get ready to have petitions signed, as they try and reach 50,000 signatures. SACRAMENTO, (CA) - As a part of its work to achieve racial and health equity in marijuana policy, the California Urban Partnership has joined the Sac Kids First Coalition. 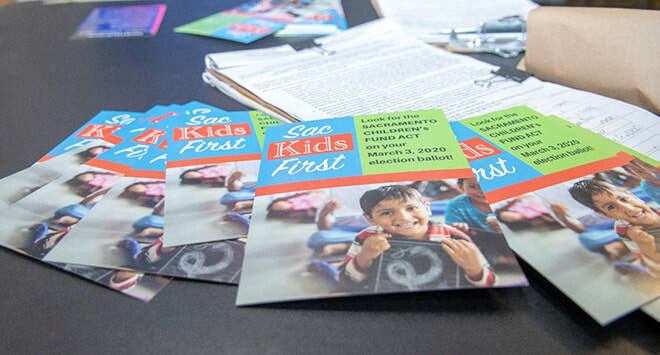 The Coalition is collecting signatures to place a measure on the March 2020 ballot which would require the City of Sacramento to designate 2.5% of its unrestricted revenue, which includes marijuana taxes, to raise about $12 million annually to fund children and youth services. This Children’s Fund would be an early investment of resources for all children but most importantly for the children of traumatized and underserved communities. SACRAMENTO (September 28, 2018) - This week Governor Jerry Brown signed Senate Bill 1294, the California Cannabis Equity Act, into law. Authored by Senator Steven Bradford (D-Gardena), SB 1294 incorporates many of the recommendations of the California Urban Partnership. It is also a major starting point in California’s recognition of the damaging impacts of decades of racialized marijuana law enforcement on communities of color, and African Americans in particular. SACRAMENTO (October 1, 2018) – Assembly Bill 1793, a marijuana convictions measure strongly championed by the California Urban Partnership and Youth Forward team, was signed into law last week by Governor Jerry Brown. Authored by Assembly Member Rob Bonta, AB 1793 will lead to the automatic resentencing or expungement of past marijuana convictions. 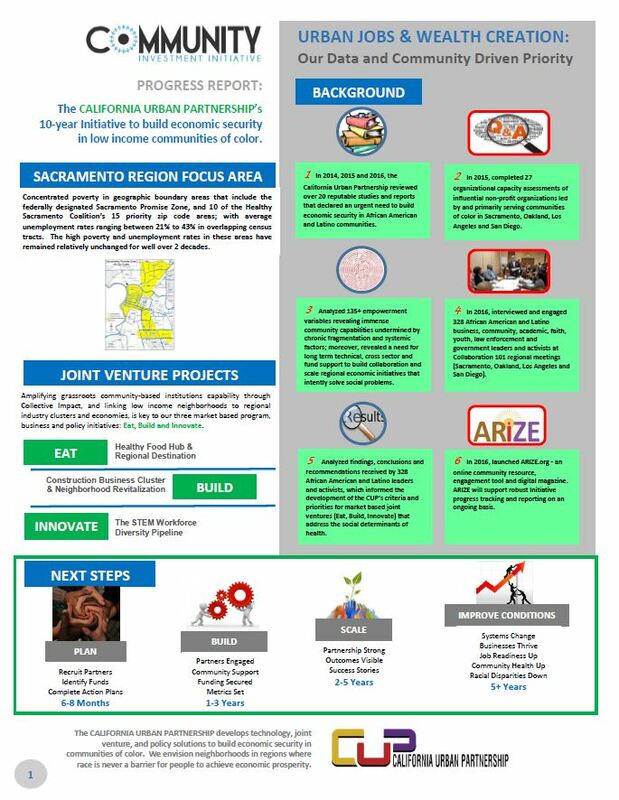 SACRAMENTO, CA (October 2018) - In a strong partnership with Youth Forward, the California Urban Partnership held a series of meetings and stakeholder calls this year with the Governor's Office of Business and Economic Development (GOBiz). The goal was to ensure that communities of color across the state will be able to provide input on the state’s new Community Reinvestment Grants program, which will be funded by state marijuana tax revenues. The Marijuana Equity Summit brought together a diverse group of advocates, organizers, and industry stakeholders to better understand how to participate and achieve equity in California’s legal marijuana trade. The event, held in Oakland, CA at The California Endowment, was co-hosted by The Hood Incubator, California Urban Partnership, Youth Forward, and Public Health Advocates. Pictured here (left to right) are Youth Forward’s, Nia MooreWeathers; Drug Policy Alliance’s, Rodney Holcombe; Office of Assembly Member Rob Bonta’s, Viviana Becerra, and Code for America’s Evonne Silva. 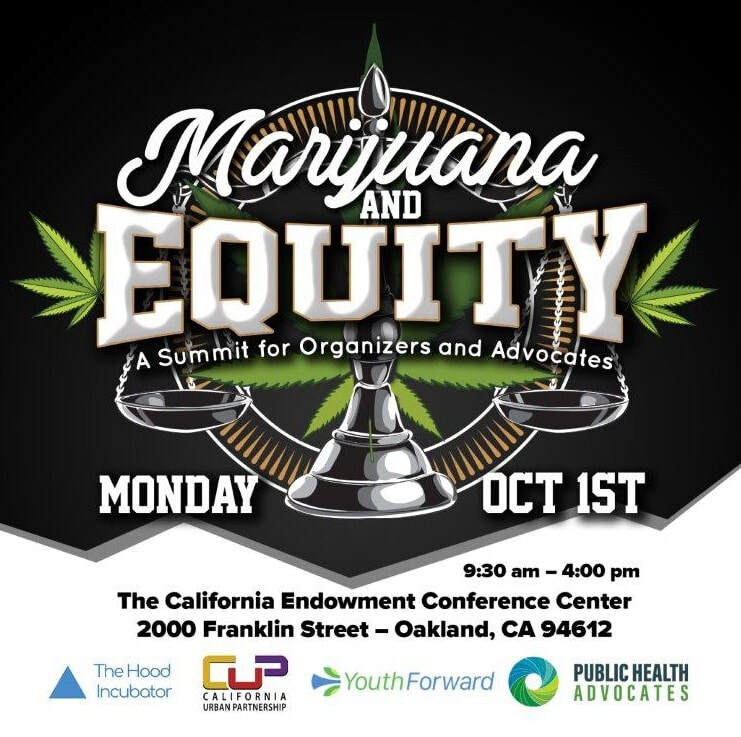 Oakland, CA – The Marijuana and Equity Summit was an overwhelming success! 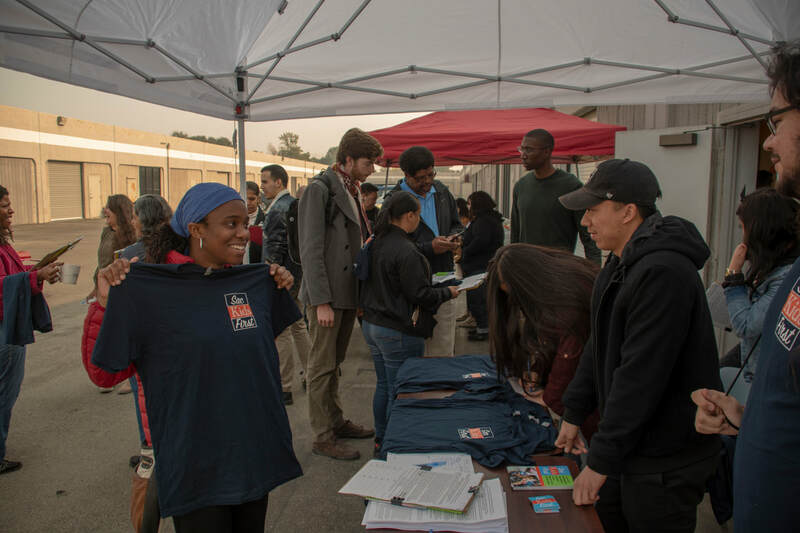 On October 1, the California Urban Partnership, along with co-sponsors, Youth Forward, The Hood Incubator, and Public Health Advocates brought together over 150 organizers, advocates, business owners, and government officials to take a hard look at Marijuana Equity in California. The Community Investment Summit brought stakeholders into workgroups focused on building collaboration to strengthen programs, businesses and public policies. 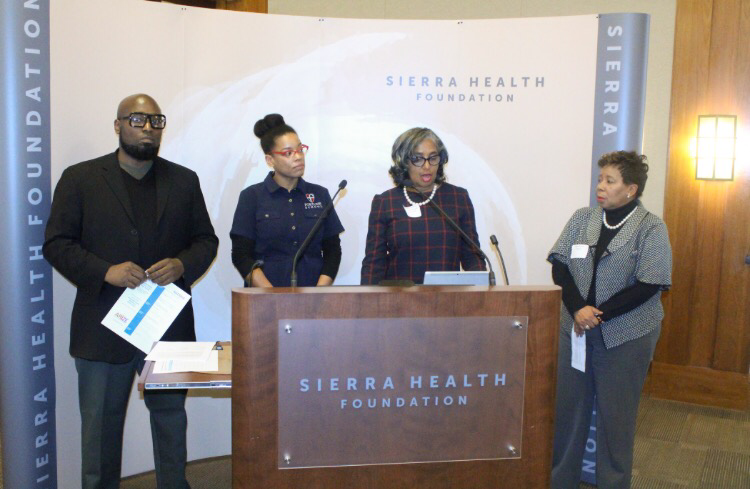 Pictured here (left to right) is California Urban Partnership CEO, Malaki Seku Amen, Fortune School CEO, Margaret Fortune, Greater Sacramento Urban League CEO, Cassandra Jennings, and NAACP Sacramento Branch President, Betty Williams. SACRAMENTO, CA - A solution oriented effort to create jobs and wealth in the Sacramento region’s African American community is moving forward. 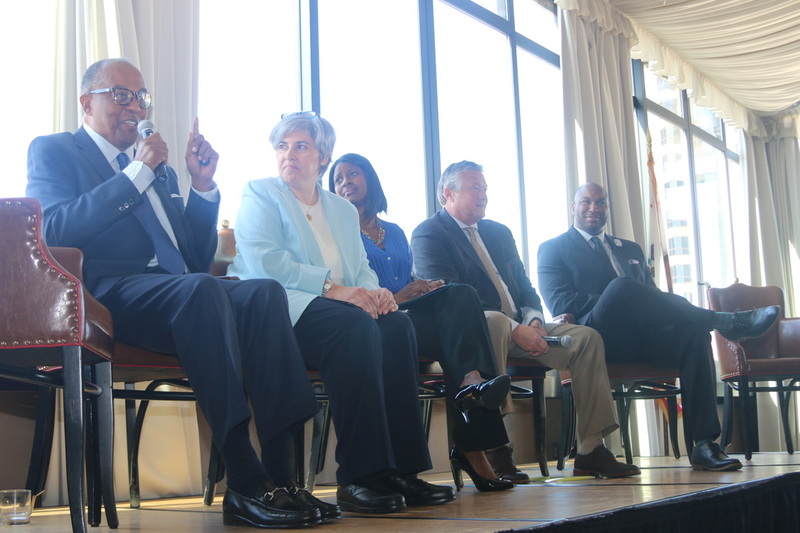 On March 24, the Urban Partnership convened over 90 grassroots, business, education, government and elected leaders at its Community Investment Summit. The event advances progress already made to build collaboration, and form a powerful community-driven response to economic inequality and injustice. Informed by research and community input, #EatBuildInnovate projects were designed to use economic approaches to solve difficult social problems. Over the next 6-8 months, the Action Teams will work to move the #EatBuildInnovate Action Plans towards community driven investment and implementation. CLICK HERE TO READ MORE! Sign Up NOW to Get Updates, Get Involved and/or Donate to support the Community Investment Initiative! CLICK HERE TO SIGN UP! Vice President of Legislative & Regulatory Affairs for the Federal Home Loan Bank of San Francisco, Kevin Blackburn, (standing) was a workgroup facilitator at Collaboration 101. His workgroup focused on actions and opportunities to grow businesses and create wealth in Sacramento’s African American community. 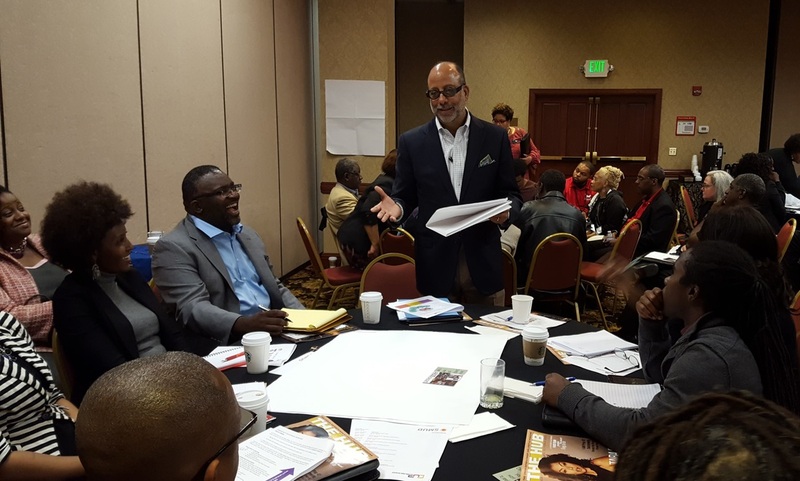 ​COLLABORATION 101 - the Urban Partnership’s 2016 forum (for African Americans in the Sacramento Region) to support long term community program, business and policy SOLUTIONS - was an amazing success. On April 22, dynamic workgroups of almost 100 local business, community, academic, youth, religious, philanthropic, law enforcement and government leaders focused on economic development, education, health and community organizing strategies. COLLABORATION 101 - part of the Urban Partnership's Community Investment Initiative process - helps groups of nonprofits to partner on project opportunities and take data-driven ACTION with a shared agenda and measurement systems, connected activities, ongoing communication and support for coordinating their collaborative work (i.e., Collective Impact). Action Teams ( for all ::::: Focus Areas ) will be formed to work on Action Plans for community program, business and policy priorities in 2016. The priorities will emphasize proactive, innovative and sustainable approaches to solving problems. Follow up meetings/forums to present and mold consensus on specific local project opportunities and/or policy issues, will be scheduled. A separate meeting/forum will be held for each Focus Area between July through October, 2016. Action Plans will be completed and compiled in a Playbook. At the March 24, 2017 Community Investment Summit, active partners from all sectors will refine the Playbook and advance the implementation of 2017 program, business and policy initiatives. Priorities for 2018 will also be considered. See baseline data guiding 2017 projects and priorities here. COLLABORATION 101 is part of a long term initiative that will increasingly expand the participation of diverse ethnic groups and sectors, as well as strategically align the priorities of all active stakeholders. A focus group approach provides a culturally appropriate and safe environment for communities of interest and trusted allies to freely discuss sensitive issues. It’s also an opportunity for communities of color to practice self-determination – in solving difficult generational poverty problems - without asking for permission or apologizing. Follow this link for more information on the Urban Partnership’s Community Investment Initiative. Chief executives of community development corporations talked about accomplishments, resources and challenges linked to growing businesses and creating affordable housing in low to moderate income communities. From left to right, Clarence Williams - California Capital FDC, Mary Rogier - Northern CA Community Loan Fund, Tunua Thrash-Ntuk - West Angeles CDC, Doug Bystry - Clearinghouse CDFI and Darrell Teat - Nehemiah Corporation. 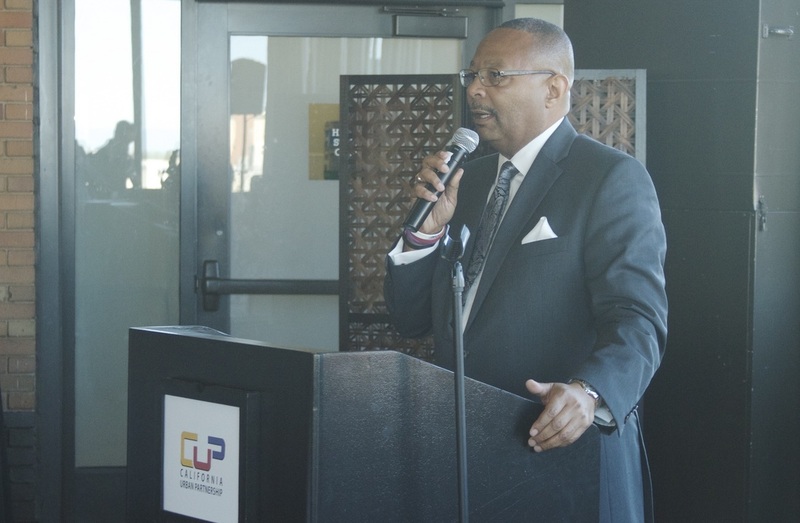 SACRAMENTO, CALIFORNIA - In the midst of national conversations on race and injustice, the California Urban Partnership recently convened an exciting Policy Forum Breakfast focused on access to capital. Over 200 community, business and academic leaders, along with government representatives and elected dignitaries attended. Entitled The State of Community Development Capital, this event aimed to develop a small business and homeownership agenda to help free low income Californians from being trapped in poverty, and the criminal justice system. Sponsors of the free breakfast forum included AT&T, JP Morgan Chase & Company, Comcast, Nehemiah Corporation, Clearinghouse CDFI and the Northern California Community Loan Fund. California now has a drastically new and challenging environment for community economic development. While research and economists point to entrepreneurship, revitalizing distressed neighborhoods and building family wealth as solutions to help low-to-moderate income Americans rise into the middle class, all of California’s programs to help make that happen are weak, or have been eliminated. The CUP forum was critically important for helping grassroots stakeholders and new policymakers understand what resources are currently in place, what gaps need to be filled, and how they can work together to make capital accessible and adequate for the business development and affordable housing needs of low income and communities of color. Create a California New Markets Tax Credit program for the purpose of attracting private sector investment to California’s low income neighborhoods. Greater insurance industry investments in urban and economically disadvantaged communities through the California Organized Investment Network (COIN). Funding for increased technical assistance, financial literacy and coaching, and capacity building for entrepreneurs and families.